/ Feature / Building a Blockbuster Bridge: Alabama DOT Paves Way for Dramatic Traffic Improvement in Mobile, Ala.
Building a Blockbuster Bridge: Alabama DOT Paves Way for Dramatic Traffic Improvement in Mobile, Ala.
Interstate 10 (I-10) is the United States’ southernmost transcontinental highway, extending 2,500 miles from Jacksonville, Fla., in the east to Santa Monica, Calif., in the west. This highway has seen steady increases in traffic volumes, and the George C. Wallace Tunnel on I-10 in downtown Mobile, Ala., has created a notorious bottleneck given its age and configuration. The tunnel was constructed in 1973 for a traffic flow of 36,000 vehicles per day, but it now sees an average of 73,000 vehicles per day, with peaks as high as 100,000 on holidays and in the summer months. Compounding the issue of volume is the fact that there are more than four lanes each way that get constricted down to two lanes each way through the tunnel, with a hairpin turn that reduces traffic to 25 miles per hour. The narrow tunnels have no shoulders, which means hazardous vehicles can’t travel through, instead having to take an hour-long detour to the north. This all adds up to severe traffic buildup and inefficiency that begs a 21st-century solution. 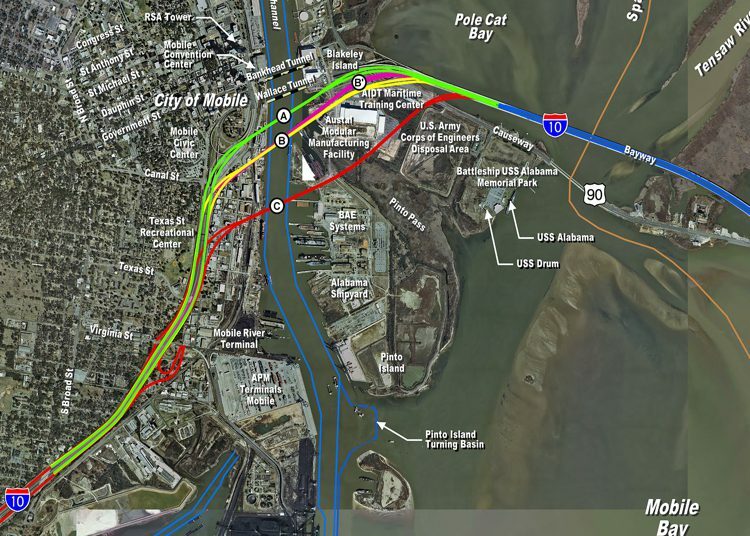 To solve this issue, the Alabama Department of Transportation (ALDOT) proposed the I-10 Mobile River Bridge and Bayway Project, which will replace the tunnels with a six-lane bridge and causeway widening to expand the existing four lanes to eight. “There has been a lot of negative feedback from the public and stakeholders in Mobile, so we were tasked with creating a visualization of the project,” says J.D. D’Arville, GIS/LRS data management administrator at ALDOT as well as visualization manager for this project. The visualization team created a 3D conceptual model of the entire proposed project with realistic renderings and animations of the driving experience as well as a 360-degree flyover to provide context from all angles around the city. Illustrating visual impact to the public and other stakeholders. Presenting project details to receive approval from the U.S. Federal Highway administration for federal funding. Demonstrating the project’s positive impact on the local economy and the city’s skyline for local-government approvals. Visualizing and sharing the project’s minimal impact on the environment. Rendering and simulating Battleship National Park, home to the memorial of the <I>U.S.S. Alabama<I> World War II battleship, showing how it will be seen from the bridge and how traffic to the park will be handled. To realistically render the project in context, a lot of data gathering was undertaken. Aerial LiDAR was flown for the full 10 square miles of the project along with aerial orthophotography and more than 600 perspective images via helicopter from 600 and 1,500 feet. Design alignments (with seven proposed routes whittled down to one prior to animation) and plans also were collected. The next step involved placing designs and photographs to present the conceptual design in context with current reality. The team also got creative in presentation efforts and methods employed to show how the bridge could provide a dramatic city transformation. Many different alignments were tested and vetted prior to picking the “B-Prime” configuration. After the project was rendered in context, the next step was to animate the driving experience as well as the aerial tour. The driving animation has 8,000 frames, and the flying animation has 10,000 frames, and both were rendered at high-definition 720p. Processing the animations proved difficult, as the computing power needed was considerable. The process to achieve a workable rendering configuration took the team nearly a year of trial and error. This view looking west toward downtown Mobile from Battlefield Park, which showcases the U.S.S. Alabama . After the animation was complete and many different photo-matched visualizations were output, it was time to share the model, images and animations with the public. The public-involvement meeting had three stations: 1) a PowerPoint presentation that looped images of photo matches and animation, 2) static still-art images and 3) a Live Cube station for sharing the model in any virtual perspective attendees wished to see. 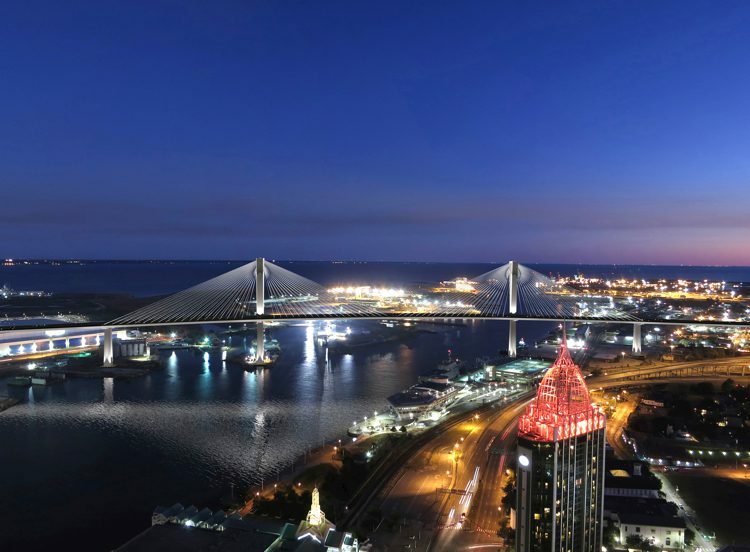 Along with the ability to showcase a view for each individual, ALDOT commissioned a study from the USA Center for Real Estate & Economic Development to assess the economic impact. The study found that “the new roadway will promote economic development for coastal Alabama and the Southern U.S. economy by reducing congestion, creating jobs, stimulating retail sales, promoting home sales and construction, and improving tax revenues for municipal budgets.” The estimated impact ranges from $537 million to $1.08 billion per year, with 64 percent of those benefits coming from reduced congestion. The presentation and public dialog was a positive experience that seemed to turn the tide on prior objections. The bridge will have 215 feet of air-draft clearance to accommodate container ships that use this deepwater port, the fourth largest by tonnage in the nation. The port has direct access to 1,500 miles of inland and intracoastal waterways. 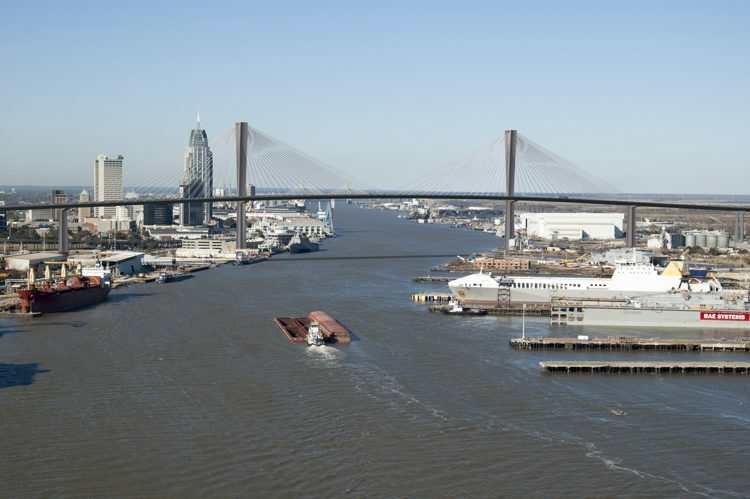 In July 2015, Thompson Engineering was selected as the design team to develop plans for the I-10 Mobile River Bridge and Bayway Project. 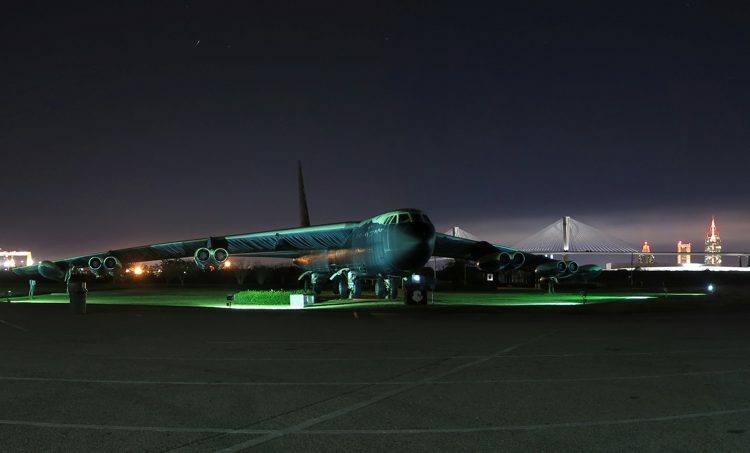 The contract was “fast tracked” so the project can move as quickly as possible, allowing for preliminary design work to commence immediately before the full contract is finalized. The preliminary design is an important step toward finalizing the Environmental Impact Statement. Additional steps are underway to investigate issues that will impact the final design, including exploratory drilling along the route to provide rock and fluid samples that will help determine the precise placement and engineering for bridge piers. Mayors from the region visited Washington, D.C., to lobby for funding for the proposal. The Alabama legislature also is working on funding, which could include a public-private partnership and tolling. InRoads by Bentley Systems provided the complex geometric design and 3D corridor modeling of the proposed route as well as visualization paths. MicroStation by Bentley Systems provided the rendering and animation for the driving and flythrough. Descartes by Bentley Systems and TopoDOT by Certainty 3D were used to manage, review and process the 10 square miles of aerial LiDAR data collected for the project. Trimble Sketchup provided the 3D city model of many buildings as well as the mock-up of the proposed cable-stayed bridge. LumenRT was the source for realistic trees, water, time of day and year, and Live Cube. LumenRT Live Cube allowed the model to be navigated and presented to the public during public meetings.